and real polished steel and silver ones. enjoying the decorative and elegant accent they add to your event. after use instead of laboriously washing them after a big meal. STOCK YOUR HOME ELEGANT CUTLERY: Taste is evident in its sleek, modern, and stylish design. An upscale plastic silverware perfect for wedding receptions. The sleek silver sheen gives the cutlery an elegant feel that is perfect for formal dinners, banquets, and dinner parties as well as everyday mealtime, picnics, and informal events. BETTER THAN SILVERWARE: See the close resemblance to real silverware in its size, proportions and finish. Great value for the price in addition with its heavy weight and durability. Not to mention the fact they're disposable making the cleaning process less of a hassle. THE FINEST PLASTIC CUTLERY: Feel the quality by the weight of it in your hand. The sleek silver finish will outshine any white or clear plastic flatware set elevating your table setting with stunning silver flatware that will complement any party theme. Same as real silverware, these plastic eating utensils are not microwaveable. THERE'S PLENTY TO GO AROUND: 125 spoons are plenty for all your guests, serving trays, multiple courses, or many meals with your family. 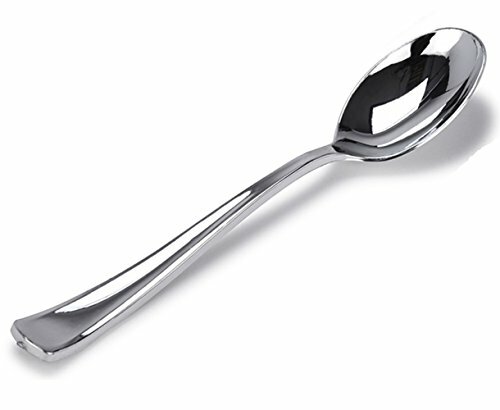 Measurement of Spoon is 7.0"L. Order yours today!